American towns and cities are continually expanding and paving their way into the future. But is this construction and infrastructure boom creating a new risk profile? Are your clients (personal and commercial) taking environmental and geological pressures into account when purchasing insurance? Mass development of urban and rural areas can have significant geological impacts. How are your wholesale brokers and MGAs performing? Take our Producers on Wholesale Partners survey! “The more we pave, the more we change our geological underpinnings,” explained Byron Smith, Property CAT Claims analyst at Chubb. Smith was the Chubb claims adjuster sent to solve one of the most intriguing geological events in recent US history - the 40ft wide and 30ft deep sinkhole that opened in the National Corvette Museum in 2014, swallowing eight classic sports cars. The trigger that opened the sinkhole under the Bowling Green, Kentucky-based museum remains unknown. Although rare, there were a number of significant sinkhole events in the US in 2017 alone. In July and August, a massive sinkhole (which stretched 260ft at its widest point) condemned seven houses in Land O’Lakes, Fla. Later in October, one occurred in Idaho caused by a water main leak in Boise State University. Despite our collective short-term memories, perils like sinkholes do occur and insurance brokers should ensure their clients are aware of that fact. Sinkhole is a unique risk, and it’s a coverage that’s included in most Chubb policies. 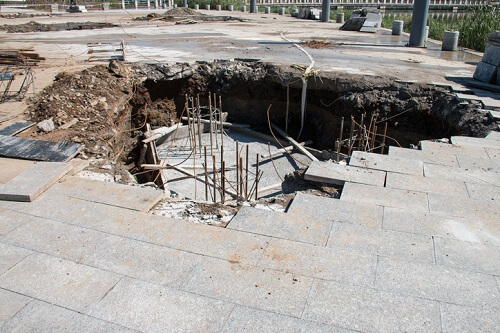 When the gaping hole developed in the signature Skydome at the National Corvette Museum, the staff didn’t realize they had sinkhole coverage with Chubb. The fact that they did meant that Smith and his expert team could partner with the museum to restore their operations quickly and efficiently. The high-profile event attracted global media attention and “certainly highlighted the risk of sinkholes” among insurance professionals, said Smith. The Corvette Museum story, with Chubb’s fast action and effective resolution, was the “catalyst that probably inspired a lot of experienced brokers to dig into [sinkholes],” which are rare outside the state of Florida, he added.